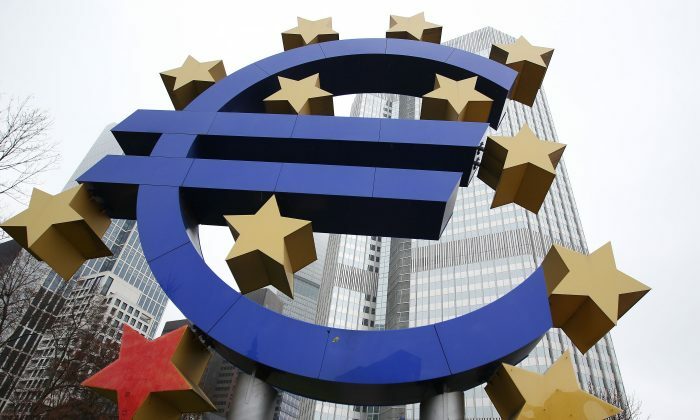 The European Central Bank is ready to initiate a 60 billion euro ($69 billion) monthly government bond buying program—quantitative easing—but that won’t do much for the moribund continental economy. Central banks can print money to purchase government bonds to push up prices and lower interest rates on those assets and competing debt, such as corporate bonds and bank loans. In the United States, the Federal Reserve also bought billions in federally sponsored mortgage-backed securities, such as those issued by Fannie Mae. The aim is to encourage more borrowing by businesses and homebuyers: stimulus spending financed by running the printing press. The Fed enjoyed some success boosting U.S. growth, but here are five reasons why QE won’t work for the ECB. The European Union does not have a large budget and issues few euro-denominated bonds that the ECB could purchase. Instead, the ECB will have to purchase individual country debt. It is as if the Fed had to purchase a basket of bonds issued by California, Iowa, and other states. Markets for European bonds—both sovereign and corporate—and bank lending are highly fragmented along country lines. Consequently, it is unlikely that QE will have much effect on banks’ willingness to make new business loans in places buffeted by the financial crisis, like Spain and Greece. QE seems to work best when central banks inject capital directly into specific markets. The Fed purchased mortgage-backed securities that significantly lowered interest rates on mortgages across America. Housing prices recovered much of the value lost during the financial crisis, and new home construction rebounded. The EU has no analog to Fannie Mae and Freddie Mac, and the ECB cannot readily purchase mortgage-backed securities to boost the European housing sector. Europe’s largest economy, Germany, recently accomplished a balanced budget for the first time since 1969, and austerity programs intended to restore solvency have forced massive government spending cuts and tax increases in Spain, Greece, and other Mediterranean states. Those spending cuts—though essential to sorely needed structural reforms—will undercut the effects of any increased bank lending that the ECB bond purchase may induce. With unemployment hovering at about 25 percent in Spain and Greece, and 13 percent in Italy, banks will remain skeptical that lending to expand businesses will do much to create bigger markets for what they sell. Although structural reforms could make Greece, Italy, and other high-unemployment economies more attractive places to build factories and establish businesses in the long run, governments in Athens, Rome, and other capitals face voters who need jobs now. And the cost of labor in these countries, which may perhaps be gradually falling, will remain too high to attract investment for many years. If Mediterranean countries still had their own currencies, they could let their currencies fall in value relative to those of northern European states. That would re-price labor to attract investment and jobs. But the single currency, the euro, deprives them of that lever. Though the Europeans have a single currency, they lack common educational standards and a single language, things that give the United States a more or less single labor market. In the absence of currency devaluation to re-price Mediterranean labor, Greeks, Italians, and Spaniards cannot migrate to Germany (where unemployment is only 5 percent) with the same ease that Americans have migrated to South Dakota and Texas to participate in the oil boom. In the end, the EU and ECB lacks what the Fed enjoys—the punch of a national government that ran large deficits to pull the U.S. economy out of recession, plus national credit, housing, and labor markets that made monetary policies like QE reasonably effective.